However, since our building is new, it is not yet included in these maps. Here we provide detailed travel advise regarding how to reach our institute from inside and outside of China. We discuss several ways in which you can travel to and in Hefei, issues you should consider such as visa and basics such as how to take a train in China. Also, we give some advise about which other places you might be interested in visiting if you come here anyway. Once you are in Hefei, you can take a taxi to our campus address and then easily find us on campus. 3.6.1. Luggage: Check out at first stop! Here we provide a couple of maps giving an impression about the location of Hefei [合肥] and our institute. In these maps, we also list potential hotels for the convenience of our guests. We have not commercial or other affiliation or relationship with any of these hotels. Here we provide a small overview map of China with some of its major cities. If you travel to China, there is a very high chance that you will stay in at least one of them. A map of the major travel hubs in Beijing. In 2013, the new Hefei Xinqiao International Airport [合肥新桥国际机场] has opened in Hefei. It has replaced the old Hefei Luogang International Airport [合肥骆岗国际机场] (IATA-code: HFE), which now is closed. Traveling from the airport to the city center by taxi will take about 40 minutes to 1 hour and cost about between 75 and 100 Chinese Yuan (CNY/RMB), depending on the traffic. Hefei has two major train stations. It is important to not mix them up, especially when departing. Hefei South Railway Station [合肥南站] is the new train travel hub in Hefei. Most fast trains will arrive or depart from here. It is relatively easy to get to Hefei [合肥] from basically anywhere in the world. This will usually involve a flight to one of the major cities in China such as Beijing [北京], Shanghai [上海], Guangzhou [广州], Shenzhen [深圳], or Hongkong [香港] and then taking a connection flight to Hefei (HFE) from there. For a long time, two-hop strategies (like first to Beijing, then a connection to Hefei) were necessary when traveling to Hefei from a foreign country. However, since recently, there are also some almost-direct options available. Take an airplane to Beijing [北京], the capital of China, and from there an airplane to Hefei. Your stop in Beijing will be at the the Beijing Capital International Airport [北京首都国际机场] (BCIA, IATA-code: PEK). It is best to plan for a buffer of at least two or three hours between your arrival there and your connection flight to Hefei (HFE). This is maybe the easiest way. Notice that domestic flights in Beijing are often delayed. Two hours delay are not a rare event. Also, The Beijing airport has three terminals and Terminal 2 is located at a different spot. If your connecting flight departs at Terminals that are not co-located, plan in at least 40 minutes time for the Airport shuttle or inter-terminal railway connection. Take an airplane to Shanghai [上海] and from there a connection flight to Hefei. Your airplane will likely arrive in Shanghai Pudong International Airport [上海浦东国际机场] (IATA-code: PVG). Be aware that there also is a second airport in Shanghai: Shanghai Hongqiao International Airport [上海虹桥国际机场] (IATA-code: SHA), as sketched in the Shanghai map above. Make sure that your connecting flights depart at the same airport, or that there is at least 3.5 hours time between them so that you can conveniently take the metro/subway Line 2 connecting the two airports. Two-hop travel strategies involving trains are maybe not the best choice for guests entering China for the first time, but for the experienced traveler they may be a cheaper alternative. Take an airplane to Shanghai [上海] and from there a train to Hefei (see the section on trains). Your airplane will likely arrive at Shanghai Pudong International Airport [上海浦东国际机场] (IATA-code: PVG) whereas the trains likely go from the Shanghai Hongqiao Railway Station [上海虹桥站]. Shanghai Pudong International Airport and the Shanghai Hongqiao Railway Station are directly connected with the metro/subway Line 2, they are almost at the two opposing ends of that line. Overview maps of the metro can be found here, here, and here. For taking the metro, you need to calculate more than 2 hours. Of course, if your airplane lands in Shanghai's second airport, Shanghai Hongqiao International Airport [上海虹桥国际机场] (IATA-code: SHA), you are almost at the train station: 1 stop with metro/subway Line 2 or a few minutes by foot. The D-Train from Shanghai to Hefei will then take about 3 to 3.5 hours. If you arrive in Shanghai and want to directly continue traveling with a train, you should buy the tickets in advance, because sometimes no tickets may be available anymore. See the section on buying train tickets below for, well, information on how to buy train tickets. Be aware that there are several train stations in Shanghai, such as the Shanghai Railway Station [上海火车站]. You can take the airplane to Beijing and from there a train to Hefei (see the section on trains). Since Beijing is quite far from Hefei, I would recommend using a fast G-train, which can travel the distance in about 4.5 hours. If you arrive in Shanghai and want to directly continue traveling with a train, you should buy the tickets in advance, because sometimes no tickets may be available anymore. See the section on buying train tickets below for, well, information on how to buy train tickets. Coming from abroad, you would probably be arriving in Beijing at Beijing Capital International Airport [北京首都国际机场]. The train would likely leave from Beijing South Railway Station [北京南站]. You could take the Airport Express subway [北京机场轨道交通线] to Dongzhimen Station [东直门站], from there change to Subway Line 2 [北京地铁2号线] to Xuanwumen Station [宣武门站], where you switch into Subway Line 4 [北京地铁四号线], which stops directly at Beijing South Railway Station. Overview maps of the Beijing Subway [北京地铁] can be found here, here, here, and here. The subway has a fixed fare of 2 RMB, which is quite cheap. However, since you need to switch subways, this approach to travel to Hefei a bit more complicated, especially for people coming from abroad. As time requirement, I think with 2 hours, calculated from the airport to the train station, you should be on the safe side. Another option is taking the route via Nanjing [南京]. You will likely arrive at Nanjing Lukou International Airport [南京禄口国际机场] (IATA: NKG, ICAO: ZSNJ) and then take a airport shuttle bus to the train station. From there, you can take the train to Hefei, which takes about 1 hour. Since you have to change the means of transportation twice, this method is maybe not the right choice for the China novice. You may first fly to Guangzhou [广州] and then to Hefei: http://www.baiyunairport.com/. You may first fly to Shenzhen [深圳] and then to Hefei: http://www.szairport.com/eng/index.htm. expedia.de, flug.de, and fluege.de – German equivalents. If you enter China through one of the major cities and then take a connection flight from there to Hefei, please remember that you will have to check out your luggage from your first flight (the one with which you enter China) unless you are explicitly told otherwise and have confirmed with at least two different flight attendants. The most likely case is that you have to pick up your luggage at your first stop in China. You then will take it through customs and check it in again for your connection flight. Your luggage will usually not be automatically be transferred to your next connection flight. If you do not check it out, go through customs, and check it in again, it will maybe not arrive in Hefei. If someone tells you not to check out your luggage, make sure it is an official person. Ask about this when first checking in your luggage at your departure, confirm with flight attendants. When you take the direct flight option or the same airline for both two-hop flights, your luggage may be forwarded, but you should always check this upon check-in and with flight attendants. If your luggage does not arrive at your destination airport, you should fill out the lost-luggage-form directly at the airport. The form may be in Chinese, but there should be a person at the airport who can help you with it. Usually, you will provide your contact information and hotel address and within one or two days, your luggage will be sent to your hotel. If you enter in order to pick up a job, you will usually use a so-called Z-Visa, which must be converted to a residence permit during the first weeks of your stay in China. For any form of tourism, attendance of conferences, or short-term research visit, a tourist- or L-Visa is recommended. This you can usually obtain by yourself or, if no Chinese embassy is sufficiently closely located to your residence, via a commercial visa agency. If you are a foreigner entering China, you will have to fill out a small yellow form (similar to what was required for entering the US some time ago) in English. You can ask in your flight to China for such a form in order to save time when going through the entry/exit procedure. Do not throw away the airplane ticket. Usually, a small piece of paper identifying your luggage is attached to it. It may be checked when you leave the arrival section of an airport. As the capital of Anhui Province, there are also convenient train connections between Hefei and many other cities in China. The main railway station in Hefei until 2014 was the Hefei Railway Station [合肥站]. In 2014, the new and bigger Hefei South Railway Station [合肥南站] has opened. As far as I know, it already manages most of the D- and G-trains to Shanghai and will eventually manage most of these fast trains. D-Train (Dong-Che) [动车组列车]. Train numbers start with a "D". A fast EMU train. Roughly equivalent to the ICE trains in Germany. Comfortable, fast. Travel time from Shanghai to Hefei: between 2.5 and 3.5 hours (depending on the number of intermediate stops), speed up to 250km/h. Usually taking this train from Shanghai to Hefei has the best price/speed trade-off in my opinion. G-Train (Gao-Tie) [高速动车组列车]. Train numbers start with "G". China's modern and comfortable high-speed train, can travel 300km/h. If you travel time with a D-Train would be over 3 hours, you will probably perfere to take this faster train. It is more expensive, though, but not too much. If you go to Hefei from Shanghai, there is not too much benefit over the D-Train. If you come from Beijing, however, there may be large difference. The rest: K-Trains (Kuai-Che) [快速列车]. Train numbers start with "K". Normal train, much slower than D-Trains, but also cheaper. The savings in money, however, usually are not worth it. Train prices in China are reasonable for D-Trains, so unless you have special plans, like taking an over-night train where you can sleep aboard, it may not make much sense to take this option. Train tickets can be purchased at any train station or ticket office. It was not possible to buy tickets earlier than 10 days before the travel some time ago, but I think this does not hold anymore or only holds sometimes now. Either way, you should buy them as soon as possible. If you enter China via airplane, then you will probably either buy tickets online and pick them up at the train station or buy them upon arrival at the train station. The online purchase method is strongly recommended: If you buy tickets at the train station, it may happen that all tickets for your favorite train are sold out, or even all tickets to your destination on the same or next few days! You can buy train tickets online via services such as ctrip by using your credit card. Such tickets need to be picked up at a train station. You can do this right before your departure, but remember to factor in that there might be long queues for the tickets. If you are a foreigner, you need to show your passport and E-ticket ID (on the online booking confirmation) at the counter. Chinese citizens may use their ID card at automates, which is more convenient. On normal days, calculating 1 hour in the queue plus 20 additional minutes buffer before the train departure is reasonable. At special times, such as starting two weeks before Spring Festival [春節], you might encounter much longer queues and waiting time. I always prefer pre-paying my bookings online, because this way I don't need to worry about having sufficient money to pay at the spot. When buying a ticket at a ticket office or train station, the following steps are to be taken. Long before the purchase of the ticket, you can already check which trains are interesting for you. 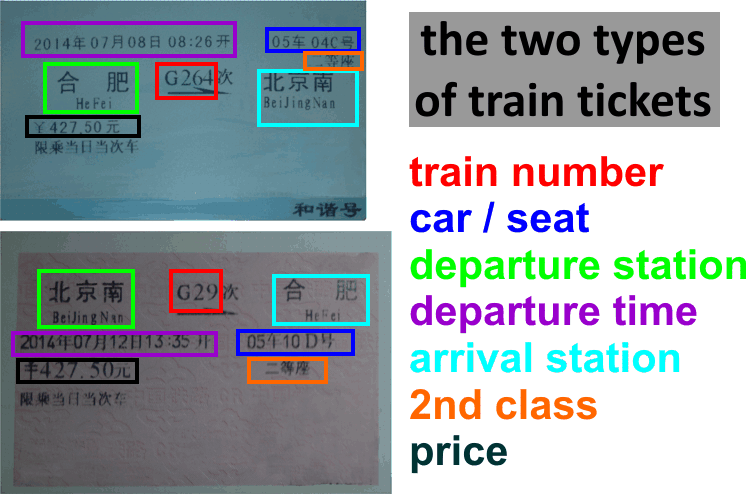 Information about train schedules and tickets may be obtained from websites such as travelchinaguide.com, chinabahn.com, or chinatraintickets.net (or at the train stations). Start date and time in ISO format (i.e., 2013-10-05 16:30 for the 5th of October, 2013, at 4pm and 30 minutes). It is furthermore a good idea to have a list of alternatives, in case your chosen train is sold out and no tickets are available for it anymore. When buying the ticket, show your passport and and the above paper to the clerk at the counter. Make sure to have sufficient money in Chinese currency (RMB/CNY) at hand. Sometimes, when you are not really sure when you will reach the train station, you can book a ticket for a late train. If you were to arrive early, it is often possible to exchange a ticket for an earlier train. But this does not always work, on some days there are too many commuters or holiday seasons may lead to full trains. So use this carefully. When entering the train station [火车站], you will pass a security check where your bag is scanned by a machine and you pass a metal detector. Since recently, passports (or Chinese ID cards, whichever you have) are also checked when entering the train station – make sure to have them at hand. You should then look for a big digital information screen which will list the train number and the departing gate or waiting area. There might be one big waiting area with multiple gates (such as in Shanghai Hongqiao Railway Station) or several waiting areas with multiple gates (like in the Hefei or Suzhou ones). In any case, the screen will list the waiting area or gate for your train. You go there. If you come to the train station much earlier than your train departs, it might not yet be listed. In that case, simply wait. Sometimes the departing gate is also noted on the tickets directly (not on our example tickets, though). After you have arrived at your gate, you will find a closed door and some seats to wait. The doors will open once the train has arrived. Above the doors, there usually are again digital screens announcing the train numbers that are departing from this gate. Yellow colored numbers mean the train will come at some point in the future, green color means the train is here and ready for boarding (the gate opens), and red means the train has already left. You wait for your train to arrive. The gate opens. Now you go in line with the other passengers through the gate. Usually, you will put your ticket into a slot at the gate which then opens for you (don't forget to pick your ticket up again when it comes out of another slot!) or show the ticket to a personnel guarding the gate. You will still need your ticket afterwards, as it may be checked on the train AND as it will be necessary to exit your destination train station. You follow the path and the other passengers to the train. Often, it is indicated at which track [站台] your train is leaving and there are indicators where to find which car number. The cars of the trains are numbered, and the car number, as well as seat number, are noted on your ticket, usually in the top-right corder of your ticket. 05车10D号, for instance, indicates that you should sit in car 5 on seat 10D. Often, there are marks on the floor of the platform indicating which car of the train stops where. You should find the right place and line up with the other passengers to speed up your boarding procedure. Find your car, enter it, sit on your seat: Congratulations, you now are using the train. The next stop of the train will always be announced via audio messages and on little screens (at least in D and G trains). Please be careful to not miss your exit. You may set a clock alarm to notify you a few minutes before the planned arrival. Once you arrive at your final destination, leave the train and follow the people to the exit, marked by a large [出口] sign. This usually means to enter a tunned going beneath the train tracks towards the exist of the train station. Once you reach the exit at the train station, your ticket will be checked again, either by a slot which automatically opens the door for you or by a clerk. This is why you needed to keep your ticket and not throw it away. Also, tickets serve as Fapiao [发票], i.e., are normally needed to reimburse train trips. Better keep it and don't throw it away, even after leaving the train station. After passing this exit, you can finally leave the train station. maybe a photo of the hotel taken from the the internet. If you show such a paper to the taxi driver, he can easily find the target and, if there is an uncertainty, he can call up the hotel and ask for directions. Only take official taxis. Official taxis always have a specific coloring which distinguishes them from normal cars. Taxis have a small light in the front window — in Beijing, it is at the rear-view mirror. If the light is on, the taxi is ready to pick someone up. If you take a taxi, the driver will turn down the light. This means that the taxi is now taken. At the same time, it initiates the automatic fare calculation. In the moment the driver turns down the light, the calculation begins. If he does not turn down the light or states that it is broken, he wants to cheat on you. Leave. In Hefei, taxi drivers are very honest people, but in some of the main tourist cities, there is a small chance that this could happen. If the taxi uses the highway, you also need to pay the highway toll. Usually between 10 and 20 RMB in Hefei. You need to ask for the bill/fapiao for that, too. Only take official taxis! Ignore people that approach you to offer taxi services and/or non-taxi cars which stop for you while waiting for a taxi. It is neither necessary nor a good idea to talk with people who approach you to offer taxi services unless you are a local, in a group, and know very well what you are doing and which price to expect. The reason is that such taxis are "unofficial". They might charge foreigners a much higher fare. In Beijing, they may ask you to pay 400 RMB for a 80 RMB ride, which actually happened to a friend of mine. Thus, waiting for an official taxi, which never takes long, is always a safe choice. Here you can find some hotels which we can recommend. We have no commercial or otherwise relationship to these hotels whatsoever. The Fengda International Hotel [合肥丰大国际大酒店] is another nice hotel not too far away from our campus. Booking: You can book this hotel online via ctrip. We always recommend pre-paying bookings online, because this way you don't need to worry about having sufficient money to pay at the spot. Here we present an overview map relating the locations of the above two hotels and our uni campus as well as our institute. You can get the high-resolution, printable version of this map here. The hotels can be reached from our campus via taxi, which is the recommended method. If you are very familiar with the locations, you may also use either bus line 901 or 603, for which the relevant stops in both directions have been marked (blue: hotel to uni, red: uni to hotel). This hotel is in Shanghai, not Hefei. We only list it in case that you travel to/from Hefei via Shanghai, maybe by following my tips below. As you can see on our Shanghai map, the Nanying Hotel [上海南鷹飯店] is located reasonably close to the city center and very close to stop Shanghai Library [上海图书馆] of Metro Line 10. It is very easy to find, while not being expensive. Plus, via Metro Line 10, you are only 5 stops away from the intersection with Line 2 at East Nanjing Road, directly in the mean tourist area. If you stay in Shanghai, I recommend staying there. Get there: If you arrive in Shanghai via Shanghai Hongqiao International Airport [上海虹桥国际机场] or Shanghai Hongqiao Railway Station [上海虹桥站], you can directly hop into Metro Line 10. Otherwise, use another line (such as Line 2) which intersects with Line 10. Anyway, if you leave Line 10 at stop "Shanghai Library [上海图书馆]" (ten stops after the train station), you are already on the right road and just need to walk it for about 400m towards West until you arrive at the hotel. You will need less than one hour from the train station to the hotel. If you are unsure about whether using the Metro is feasible, you can still get there by taxi. Booking: You can book this hotel online via ctrip. e always recommend pre-paying bookings online, because this way you don't need to worry about having sufficient money to pay at the spot. This hotel is in Beijing, not Hefei. We only list it in case that you travel to/from Hefei via Beijing, maybe by following my tips below. This hotel is located reasonably close to the city center although a bit hard to find. I visited it when it was still called "Kaichuang Golden Street Business Hotel" [北京凯创金街商务酒店], while now it is called "Zhotel (Beijing Wangfujing Center)" [Zhotels智尚酒店（北京王府井中心店）], so I am not sure how it is run right now. However, it is located very closely to the main tourist areas, namely Wangfujing [王府井] and in walking distance to Tiananmen [天安门] and the Forbidden City [故宫] while being reasonably cheap. Get there: You should get there by taxi, although it is not soo easy to find. It is in a side street which goes right by the fairly well-known Catholic East Churchen, which is also called Wangfujing Catholic Church and Saint Joseph's Church, in Chinese [大圣若瑟堂], as illustrated on our Beijing map at the start of this article. If the taxi driver does not know where the hotel is, let him drive you to that church. Then stand in front of this church, looking at its entrance, you walk forward, passing this church by walking forward into a side street on its left. After about 200 to 400m, you will find the hotel on the right side of the street. You never need to take any turn. Fapiaos [发票] are the official receipts or invoices used in China. They are nicely explained here. They are relevant for a foreigner especially if she comes to Hefei due to an invitation of a Chinese colleague and is reimbursed. Then it is important to collect the receipts of anything you do. Without fapiao, nothing can reimbursed. Whenever you pay for something, be it taxi, hotel, or whatever, always ask for a "Fapiao", an official receipt, right from the beginning. If you enter a taxi, right after you tell your destination, state "Fapiao". Only official taxis can be reimbursed, no black taxis. The request for "Fapiao" is pronounced in German as "Who schü iao ihh-ge Fah- Piao" [我需要一个发票。] or "Wo schü-Jao Fah-Piao! Fah-Piao! ", which roughly sounds like "Woah schue yeahoo fahh-pee-ah-hoo! fah-pee-ah-hoo!" in English pronunciation. The need to collect all payment and travel proofs also holds for tickets and boarding passes for flights. If you do not have them, the corresponding flights cannot be reimbursed. These strict rules may sometimes be inconvenient. They come from China's effort to fight corruption and you should keep this in mind, as this is a general indicator that the country is actively trying to improve. When purchasing airplane tickets, some additional restrictions may apply: Tickets may often only be reimbursed if purchased from special, Chinese, certified agencies. Before buying tickets by yourself, make sure to consult with the inviting party about how to best do this. They may even purchase them for you. If you can spare a few extra days on your trip to Hefei, I recommend to enter China via Beijing and to leave it via Shanghai (or vice versa). This way, you can spend a few days in these cities and can have quite a large "China-Experience" in only one trip: Go to Tiananmen [天安门], the Forbidden City [故宫], and The Bund [外滩] and People's Square [人民广场] – touristics must-sees, plus visit the Pearl of Asia itself: Hefei. Since there are many, many taxis in China, you can never really get lost. If you don't know where you are, simply take a taxi back to your hotel. Thus, you should always have that small paper with your hotel address and contact person phone number with you that I mentioned above. As you need to pay taxis and food with cash, better exchange a sufficiently high amount at the airport. This is especially true if you did not pre-book and pre-pay your hotel and/or train rides. A taxi drive may be between 100 and 200 RMB from the airport to the hotel in Hefei, add the costs for your hotel stays from your reservation emails (if not pre-paid), plus, say, 200 RMB for buying food and things for 2 days. The exchange rate at the time of this writing is between 6 and 8 RMB for 1 Euro. The Hefei Xinqiao International Airport has some banks and ATM on its second floor (the departure floor) where you should be able to exchange money. To be on the safe side, you might consider to exchange some cash in your home country before coming to China. Also, consider that your bank may find it dodgy if some money is extracted from your card from within China if you are normally not located in China. They might prevent such a transfer, thus leaving you without money. Therefore, it makes sense to announce to your bank well in advance that you will spend time in China and/or to pre-exchange some emergency money. China is maybe one of the safest places in the world and the vast majority of people you will meet here are kind, open, friendly, and honest. In Hefei, store owners are generally honest and charge foreigners the same prices as locals, even if they know that the foreigner cannot really judge the price and could probably be charged more. You can always feel entirely safe and relaxed. That being said, in this comprehensive travel advise, we still should point out that in some of the major tourist locations of China, say at The Bund [外滩] in Shanghai or Beijing's Wangfujing [王府井], foreign tourists may be targeted by some scammers. However, you can have a very pleasant and safe stay without any problems if you follow one very simple rule: Do not talk with anyone who approaches you unsolicitedly. If someone approaches you to talk, say "No! ", turn around and walk away. This may seem rude sometimes, but well, better safe than sorry. You may not that easily realize that you are in the process of being tricked until you have lost some money. A good example is the famous tea house scam, another one are black taxis charging foreigners a much higher rate than official taxis while advertising being especially cheap. If you want to do a trip, make conversation or whatever, seek it by yourself at an official place and use official means only. Only make use of officially offered services, official taxis, official guided tours, etc. and ask for fapiao upfront. China is generally a very safe place. In all of my time in China, not a single moment did I feel unsafe. By following the rule above and always asking for fapiaos when you purchase stuff, you can feel entirely safe and have an incredible nice experience.